Republic Day in Sri Lanka is not a public holiday, and many Sri Lankans don't even know that such commemoration exists. Nevertheless, May 22 is an important day in the history of the country. Colonization of Sri Lanka began in the early 16th century. The island was initially ruled by the Portuguese, then by the Dutch. In 1815, it became a British Crown colony known as British Ceylon. The Sri Lankan independence movement began to emerge in the beginning of the 20th century. It was a peaceful movement aimed at achieving self-rule for Ceylon. The independence of Ceylon was declared in 1948. The newly independent country was a Dominion within the British Empire. In 1972, Ceylon repudiated its dominion status and changed its name. 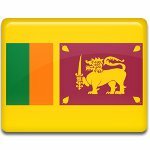 Thus on May 22, 1972, the Republic of Sri Lanka was established. In 1978, the new Constitution was adopted, that changed the country's name to the Democratic Socialist Republic of Sri Lanka. The proclamation of the republic marked the new era in the political history of Sri Lanka. Initially Republic Day was a public holiday, but the new government abolished it in 1978. It was celebrated during a short period in the 1990s, but then it was forgotten again. Nevertheless, some Sri Lankans are convinced that the abandoned Republic Day is the country's true Independence Day.